Microsoft's Fix It software, which tries to automatically figure out what's wrong with your computer, is now available for Windows XP and Vista. The software is in beta, and can run diagnostics for 300 common problems with Windows. When you run Fix It, you'll see a list of things to examine, such as display quality, performance, and incoming connections. 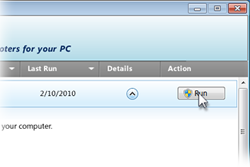 Clicking the "run" button next to each item launches an automatic troubleshooter. Each one only takes a minute or two. And, frankly, I wasn't aware that the automatic diagnostics existed. They're not easy to find in Windows 7, and I haven't had any major problems with my PC that would prompt me to look for solutions. But I did manage to tune up a couple things -- mostly programs running at start up that were affecting performance -- with help from the Fix It software. 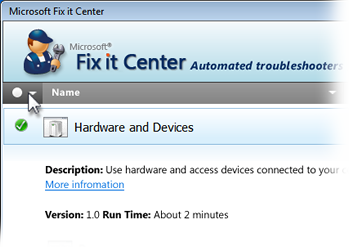 I'm interested to hear if anyone has successfully used Fix It to tackle major PC problems.